I’m (still) very interested in natural and organic cosmetics. Even though nowadays I use both synthetic and natural products together, I prefer organic ones in my skincare. Now I’m no expert when it comes to ingredients, but I still read INCI-lists and recognize some ingredients that I love, because I’ve noticed that they suit my skin really well. These are ingredients like aloe vera, jojoba oil, shea butter, argan oil and birch sap. You can find a lot of these ingredients in natural skin care products. By the way, I think it’s funny how in cosmetics it’s always advertised, that the product contains some plant-based ingredient, but when you look at the INCI-list, it’s actually listed at the very end. Meaning, that the product doesn’t really contain that advertised ingredient as much as one would think. But when you look at natural products – the advertised ingredients are actually the first ones on the list. Meaning, that the product really contains a lot of that advertised something. In lotions and creams it’s obviously not just about the ingredients – what’s important is how the product performs. How does it feel on your skin? Does it apply smoothly? Does your skin feel lovely afterwards? With synthetic cosmetics the feeling is usually pretty lovely – silicones bring special smoothness to the skin. I feel like that’s one of the things, that kind of separates synthetic and natural cosmetics from each other, how they feel on the skin. 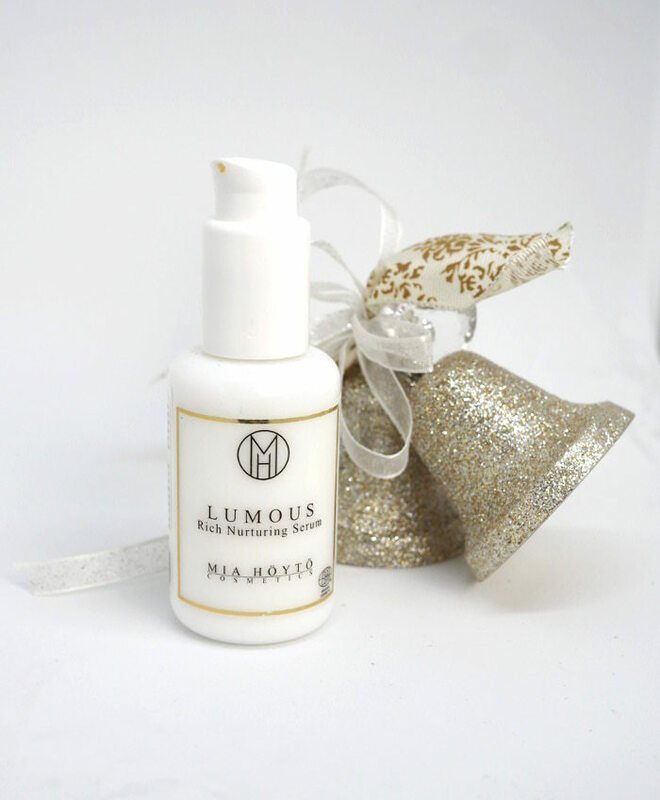 Natural cosmetic industry is advancing all the time however and now there are products, which can make your skin feel and look smooth. I have found a particular brand, which has made a good impression on me. The products make my skin feel lovely. I got a few products to try out from Mia Höytö from a pr-company called Sugar. Now that I’ve tried them for a few months, I can share my experience and crush on them: they are just lovely! Mia Höytö is ecocertified cosmetic brand from Finland. The packaging of the products is simple yet beautiful – which is obviously the first thing I pay attention to. A beautiful jar in the bathroom makes you happy by just being there and it’s nice to keep at sight (I own so much cosmetics, that hiding them seems impossible anyway). I consider these luxury products, even though they are not that expensive. Earlier I talked about the fact, that my skin feels lovely using these. The consistency is made to be so good, that the product slides well on the skin and leaves a nice soft finish. I remember talking about this with my friend and with Mia Höytö (yes, her – the amazing woman behind the brand!) at the organic cosmetics convention – the serum we tried there felt like silk on our skin – totally different to any other natural products we’ve tried. In other words: it kind of felt like it had silicones in it (even though it absolutely does not contain them). Out of the three products that I tried, that particular Lumous -serum rose to be my favorite. It’s very lightweight, it absorbs quickly and it suits my skin type. I use it under my cream daily. I also tried Valo -eye cream. It felt nourishing and very moisturizing without being too heavy. A little goes a long way with this one, so a small jar lasts long. The third product I tried was Helmi -mask. I used it this way: I applied it on dry skin, let it dry so it becomes see-through and then with damp fingers and circular movements I exfoliated my skin, before rinsing it off. If you want the treatment to be gentler, you can skip the last part and just rinse it off. Or if you’re in a hurry, you can just exfoliate your skin and skip masking. The mask absorbs impurities, exfoliates and brightens the skin. I like this mask, when I want to treat my skin gently. It doesn’t feel as efficient or drying as some of my other purifying mud masks, but especially during Winter, it’s only a good thing. Altogether I liked the products and I think they are lovely – so if you’ve thought of trying them out, I recommend. You can buy these for example from runway2street.com. See all the dealers here. I think natural cosmetics has taken a huge leap forward. People use more and more natural cosmetics and the gap between synthetic and natural isn’t that big anymore. I would love to hear your thoughts on the subject – do you use natural cosmetics or do you prefer synthetic? Why? In the end the biggest reason for me to use natural products is the environment. Natural products don’t burden our planet as much. There is a lot of micro plastics still in many products and they end up in our seas. Sunscreens are one of the worst products, when it comes to the enviroment. Though I have to admit there is a big difference between synthetic and natural sunscreens – and it’s one of the few synthetic products I still use. But if I check the facts, natural sunscreen beats synthetic ones 10-0. If you want to read more about that, check my post dedicated to that. When it comes to natural organic products and makeup, Zuii Organic is my absolute number one choice. It doesn’t really get any better than that – and let me tell you why. What’s impressive about the brand to me is how it combines ecological values, pure and unique ingredients and great quality products. But that doesn’t necessarily convince you. I hear you – and I’ve gathered some proof. The whole ingredient list is pretty readable too (and awesome), but let’s not get into that too much. Because I know there are people, that don’t necessarily care about the ingredients as much as the actual results. The flower base makes all Zuii’s powder products extremely smooth and easy to work with. It’s different to other powder products I’ve tried and the only reason I can come up with is the special flower recipe. The makeup powder isn’t totally matte – it leaves a natural glow to the skin unless you powder it. If I compare it to mineral makeup, I think it’s a bit softer and leaves almost like a blurred finish. The natural ingredients make the products very nourishing – but they can be used on oily skin too. Actually, there are some ingredients in the products, that balance oil production and reduce inflammation. The makeup powder is best on my face during the colder months, when my skin is not as oily as in the Summer, but I still use it through the whole year. It stays better of course with a primer and a powder so you can combine it with whatever products you have. These are not one of those products, that only work together – they can be combined with other (say, synthetic) products as well. I have small collection of Zuii products and the newest addition is the new Lip & Cheek Creme, which I received as pr. As you can probably tell, it is a cream blush and lipstick in a beautiful diamond packaging. The shade I received is Janus, which is a neutral red. At first I though it was too warm for me, but it actually looks great on my complexion. You can swipe the product on gently with your fingers to get the no-makeup-makeup look, but if you apply it with a brush, the color gets more intense. As usual – there is a lot of pigment in this amazing product. Lately I’ve been into cream products more – they are perfect for glowy looks or if your skin is at all dry. Definitely a new diamond in my makeup bag (ha ha). Have you tried Zuii Organic products? Do you use organic makeup products or are you interested in what your products contain?